Lock in a great price for Fikas Hotel – rated 8.9 by recent guests! Friendly owners. Good breakfast. Nice pool. Walking distance to the beach. 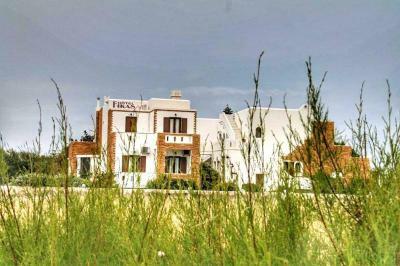 Hotel Fikas is a small family run hotel by Toula and her mother. 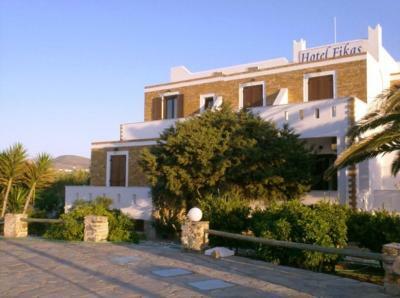 I stayed in hotel Fikas during my visit to Naxos in August 2018 with my wife and 7 year old daughter. Upon arrival, we were given a warm welcome by Toula. The check-in was very quick and everything was kept ready. 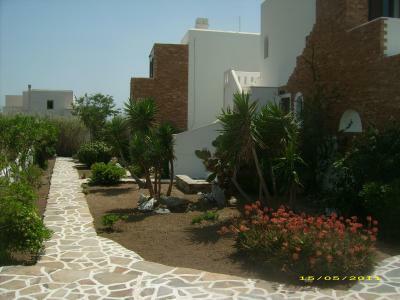 Toula was very accommodating, hospitable and extremely helpful. Breakfast was excellent and the room had good wifi connectivity. The hotel is 10 mins walk to St. George beach and 5 mins walk to the supermarket. The hotel also has a nice swimming pool and the rooms are clean. We are extremely grateful to Toula for dropping us to the port in time for our ferry to Athens or else it would have been a huge inconvenience to change all our bookings accordingly. She was our savior of the day. Overall the hotel exceeded our expectations and it was value for money. 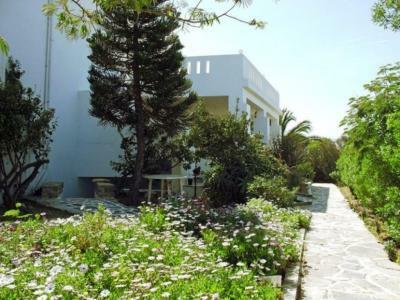 I would definitely stay in this hotel during my next visit to this island and would highly recommend this hotel to anybody travelling to Naxos. The owner was fantastic. She arranged for tour and picked up and dropped off our bags at the port. The rooms are very clean and spacious. Easy walk to town. Lovely clean pool, friendly and helpful staff. Clean bedding everyday. Lots of choice for breakfast. Great value for money. Very nice breakfast, everything is very clean, the owner was very friendly and helpful...the most hospitable I know !!! Lovely big pool. I cant review hotel because we were moved to Sunlight Studios next door - the double room we booked was not available on arrival. It's about a 20 min walk to the centre & harbour. Few mins from bus stop, bakery, huge Spar supermarket & open air cinema. 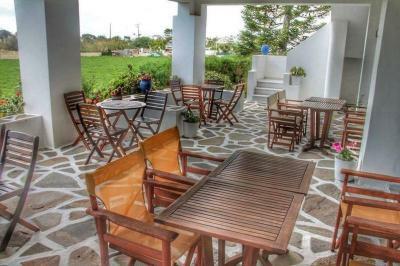 Fikas Hotel This rating is a reflection of how the property compares to the industry standard when it comes to price, facilities and services available. It's based on a self-evaluation by the property. Use this rating to help choose your stay! 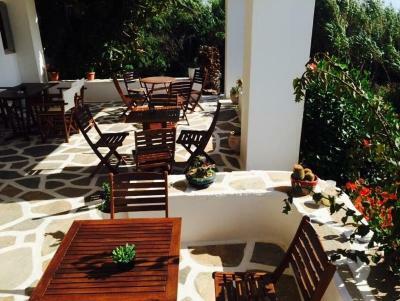 Located 2,650 feet from downtown Naxos and 1,000 feet from Agios Georgios Beach, Fikas Hotel offers a pool and a breakfast buffet. 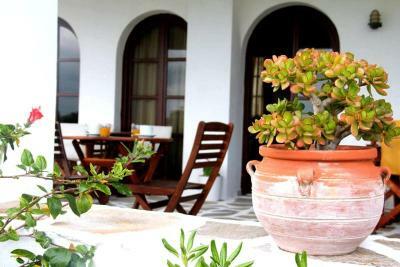 All rooms at Hotel Fikas have a balcony overlooking the garden and pool or the landscape of Naxos. Each has air conditioning and a fridge. All units include a TV and a radio. Breakfast is offered in the dining area or in the rooms’ furnished balconies. Drinks and light snacks are served at the pool bar. Guests have free access to the sun loungers and umbrellas in the pool area. Free Wi-Fi is available in the hotel’s public areas. The hotel is within 350 feet from a supermarket. Staff at the tour desk can offer information on nearby attractions such as the sandy Agios Prokopios Beach 3.7 mi away. Free private parking is available in the hotel. 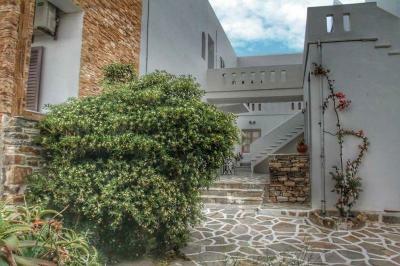 This property is also rated for the best value in Naxos Chora! Guests are getting more for their money when compared to other properties in this city. When would you like to stay at Fikas Hotel? Featuring a private balcony, this air-conditioned room includes a TV, mini fridge and private bathroom. House Rules Fikas Hotel takes special requests – add in the next step! Fikas Hotel accepts these cards and reserves the right to temporarily hold an amount prior to arrival. The owners were wonderful, the breakfast was great and the pool was very clean. The room had fantastic air conditioning and the room was serviced every day. Would highly recommend. The value for money was fantastic. The bed was a little too firm for me. Owner was unable to collect us from the port as promised because of the traffic. This wasn't a problem as we got the bus. She did kindly drop us back to the port and was available to offer any advice we needed. However, when we arrived the double room we booked was not available. We were offered a family room instead with 3 single beds or an apartment room in Sunlight Studios next door which we took and enjoyed our stay so I can't really review Fikas Hotel. Excellent hotel and very close to the beautiful beach. Toulla was the best. She helped us with everything. The view was nice and the breakfast as well. Awesome big pool, tidy, clean rooms (stayed in two rooms as the lock on our first room broke so they moved us to another room so they could fix it the next day), staff were really accommodating and helpful!